As a spinster, it's important to be able to talk to people about interesting things. You want people to know that you're not alone because you're boring or socially inept. You're alone because...well, there's really no reason other than you're supposed to be alone right now. Sometimes, though, you meet someone with which none of your interests coincide. And for this, I have devised party questions. It's not ground breaking, but it usually works. As you'll find over the next few days, most of my go-to party questions have to do with childhood. So today's question is: What was your favorite thing to play at recess? My friend Phoebe had the best answer to this question thus far with a game she and her friend used to play in her childhood home-village. Phoebe and her friends used to make a game of seeing who can sit the most still for the longest. This sounds like an authority figure's dream. Phoebe was a real champion at this game, too. She said that once she was so still for so long that she let a bug crawl across her face and didn't even move. Amazing. I don't remember a specific game I used to play in childhood, but I do have two specific recess Memories. The first is that my friend Elizabeth and I, for what seems like it was weeks, tried to dig under the fence of the playground in efforts to escape school and run away. I am really surprised we were never successful what with all that time spent digging. 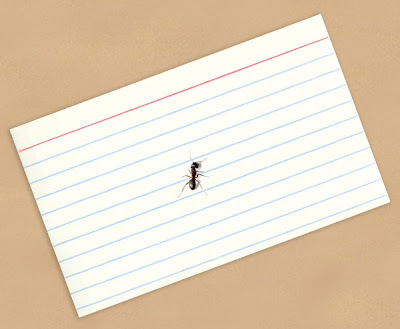 The second is that my friend Macky and I one day found an ant in our fourth grade classroom. Before recess, the ant met its untimely demise, and we decided to have a funeral for it at recess. Macky stipulated that everyone had to wear at least one black thing in order to attend the services. She, of course, had worn her black raincoat that day and would be leading the procession. The ant's final resting place was through the gate and to the left, and Macky Glued the ant to an index card in lieu of a coffin. And there was a very somber eulogy. Now, nearly twenty years later, I wonder if the ant's family still visits it's grave, leaving crumbs on the burial site. Try this at your next awesome party when you're not discussing old episodes of Frasier. Because I know you do that, too.